Nobody within the Greens exactly thinks that a “Jamaica” coalition would be a dream team. Everyone knows how far the left-most parts of the Greens are from the often openly racist rhetoric of the Bavarian CSU. But in my opinion forming a coalition with FDP and CDU/CSU would be much worse than just a slightly unideal partnership. It would almost certainly mean selling out our values and losing all remaining credibility (which is already hampered due to the car industry friendly Green government of the State Baden-Württemberg). The Greens would be relatively weak as the smallest of the coalition partners. They are the only one of the four who is really interested in combatting climate change, or who understands that neoliberal economics aiming at eternal growth is not an option socially or environmentally. FDP and CDU/CSU represent the same neoliberal politics that have caused climate change and the global rise of inequalities. CDU and CSU just announced they want to limit the number of refugees allowed to Germany. So, being part of “Jamaica” would mean an integration of the Greens into the shift to the right that the political mainstream is currently undertaking. Some might hope that having the Greens in the coalition would at least give a social and green conscience to an otherwise devastating government. But looking at SPD, the coalition partner of Merkel’s CDU/CSU until now, it becomes clear that not even a more powerful partner than the Greens got her to e.g. 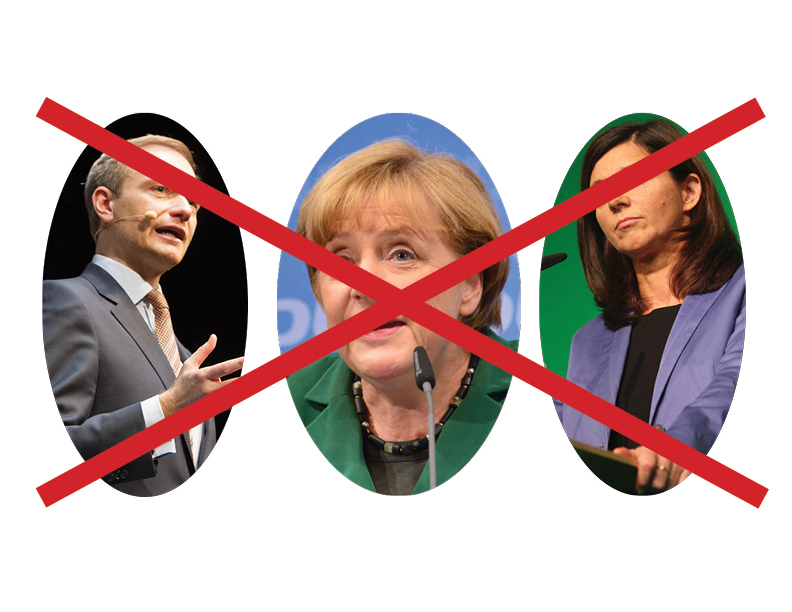 stop austerity; and all tiny moves of SPD ministers for climate or social politics were changed into something harmless by CDU/CSU. SPD had to support Merkel’s politics, and now is just a zombie of what it has once been, with their lowest election result since 1945. The liberals didn’t even make it back into parliament after they had been in coalition with Merkel. Why should this not happen to the Greens, whose chances of doing more than greenwashing the neoliberal politics of FDP and CDU/CSU in a Jamaica coalition would be close to zero? To keep this planet livable, big change is needed – which might be possible at some point in a left coalition with Linke and SPD. We cannot prepare for this while in a government where we would have to compromise when it comes to human rights and environment. Today, we hear the stories of Eva and Mona on the pro’s and cons of the Jamaica coalition. Read Mona’s article here!